Why should FDR be on your training agenda? Sessions address EEO, HR/LR/ER, Alternative Dispute Resolution, Legal Issues and more to provide you with authoritative guidance and best practices to avoid costly claims and to keep your agency compliant and running efficiently. FDR’s Advisory Board, composed of experienced practitioners, carefully selects session topics to ensure that your top challenges are covered. 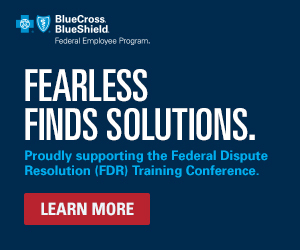 Hands-on training on how to most effectively use cyberFEDS®, the most comprehensive online resource for federal civil service law, to meet your daily workplace challenges. A rare opportunity to hear from — and speak directly with — leaders of the EEOC, FLRA, MSPB, OPM and OSC. You’ll gain vital insights about the agencies’ goals and have the chance to ask the leaders your specific questions. Connect face-to-face with your peers from other agencies from across the nation to share ideas and discuss solutions to common challenges. The best ROI for your federal training budget.